A NOSTALGIA radio station run by pensioners can now be heard on digital DAB radios in Woking. Angel Radio plays music from the 1920s through to the 1960s, and most of its staff are over bus-pass age. 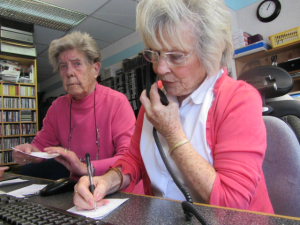 In fact the station’s two main receptionists are in their 80s and each work 30 hours a week. While the oldest presenter is 92-year-old Audrey, who is on air three times a week, there is also a dedicated band of younger people aged 14 to 23 who love the old music and host their own shows. Jean Kelly has been with Angel Radio for more than 10 years and says: “I love it. It gives me a reason to get up in the morning. When my husband died I started turning into a couch potato and then I discovered Angel Radio. Angel Radio’s Station Manager, Tony Smith, told the News & Mail: “I am delighted to be able to spread our wings to Woking. We have been on air in West Sussex, Hampshire and the Isle of Wight for many years and have built up a large audience. “I hope people in Woking enjoy our unique programmes. We are very friendly and very accessible. So, if anyone wants to hear their favourite old 78rpm records they can phone us free during our request shows on 0800 014 1955 and we can usually have the music on air within a few minutes. “We have more than 138,000 records in our library dating from 1900 to the early 1960s. We have won many awards for our unique work and have even been praised in the European Parliament in Brussels.